Many older homes accumulate interesting histories, and ours is no exception. Our 1916 Colonial Revival, rapidly approaching the century mark, has housed a rubber company magnate, a Bell Telephone executive, and the owner of a car dealership, among others. But perhaps the most interesting occupants were the “girls” of Alpha Chi Omega. Although the house isn’t on “fraternity row” on East Main Street closer to the Kent State Campus, and is, in fact, on the other side of town, the home had two appealing qualities that enticed Alpha Chi Omega’s Gamma Lambda chapter to call it home for thirteen years. The house is quite large and, as is well known around town, has a sizable pool in the basement. Yes, the 20 by 30 foot pool is literally underneath the dining room floor and is accessed by going down the basement stairs. When we say we have water in our basement, we actually mean it! Alpha Chi Omega moved into what is now our home in 1959; they had to make some immediate modifications to accommodate the sorority lifestyle. The former maid’s quarters (a small, separate apartment on the first floor) was converted into living space for the sorority’s housemother. A “triple shower” was installed in a second floor bathroom, a large shower enclosure with three showerheads. Of the four bedrooms on the second floor, one was set aside for the sorority’s President and Treasurer. Two other bedrooms were set up as quads with room for four occupants. The room that is currently our master bedroom, a fairly large chamber, was outfitted to accommodate eight girls. The large, finished attic was set up to accommodate as many as six more (no doubt the new pledges!). The Kent State University Chestnut Burr yearbook from 1959 reported that “Gretchen,” Alpha Chi Omega’s Model A Ford car took a “backseat” that year “as the girls concentrated on their newly purchased house with its heated, indoor swimming pool.” Pool parties were apparently one of the major perks of living in the house. Having a readily accessible swimming pool also paid off handsomely when the sorority won first place in the campus intramural swim meet in 1968. In 1972 the sorority sold their spacious home to Robert W. and Katherine B. Hart, and it eventually passed to us seventeen years later. But the house still bears evidence of their long occupancy. The large, built-in linen cabinets still bear labels for “single” or “double” sheets, “mattress covers” and the like. Initials are still deeply carved on a support column in the attic; one column bears the mysterious name “Weddy” on it. At one time we could still see the sorority’s signature letters carved on the trunk of an old English copper beech planted in our yard (see our previous post, Roots https://sixtysixtyblog.wordpress.com/2014/05/06/roots/). 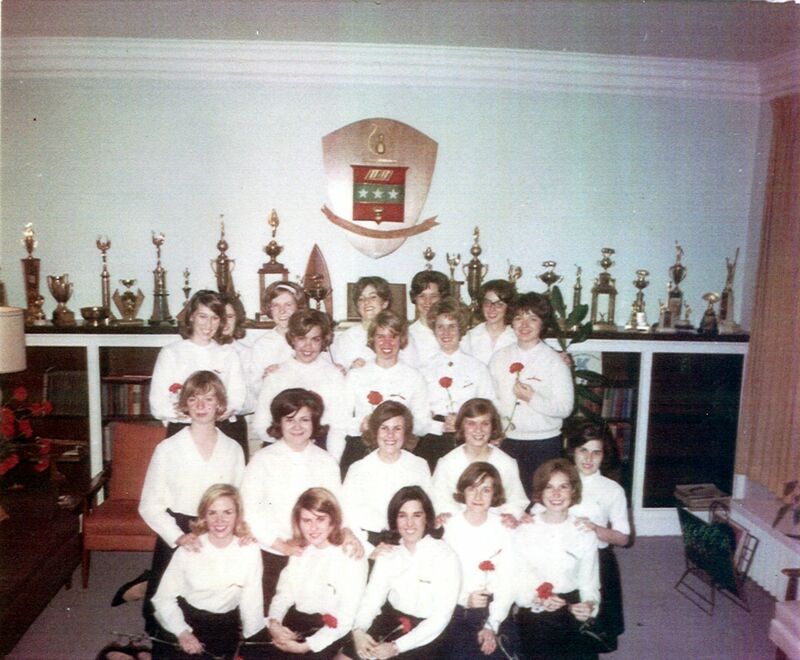 The Gamma Lambda chapter of Alpha Chi Omega disbanded in 1973; we can only speculate on the reasons. Perhaps the sorority was a victim of the changing times when customs and conformity were being challenged. On Tuesday, July 19, 2005 thirty-two Alpha Chi Omega “girls,” now mature women, returned to visit the home they had once lived in. They were in Kent for a Gamma Lambda reunion, their second reunion in forty years. The reunion coordinator had contacted us about visiting their old home, and we agreed. The sorority sisters arrived en masse, visibly excited. We had expected to give them a group tour of the house, but as soon as they entered the front door, they scattered in all directions, fanning out into the kitchen, the dining room, the living room, and up the stairs to the second and third floors. The house had once been their temporary home at an important point in their lives, and we were amused to see that they still felt at home—as if the intervening decades had suddenly been erased. As we followed them through the house, it was as if a window opened into the past. We heard about how the sorority had utilized our various rooms. A small parlor room we use as a music room, for instance, was once a dining room, painted blue and set up with three tables for formal meals. We also heard some pretty interesting stories—some of which we will relate in blogs to come! More than one sister commented to us that everything used to “seem so much bigger.” Our visitors were especially delighted to discover the carved initials on the attic support beam and speculated as to who “J. L.” and “N. H.” were. The law and real estate documents tell us we “own” the houses we live in. But old houses like ours, often built to last for a century or more, have many owners. To an old house like ours, we are just visitors, temporarily taking up residence, before we are quickly replaced by others. We are a small rivulet of humanity moving through and within the embrace of the house’s solid plaster and lath walls, hardwood floors, and high ceilings. We leave signs and signals, like the initials on the old beams, of our passage. Old houses bear silent and stolid witness to our births and deaths, successes and failures. They are blind and mute to our frequent indiscretions. They tolerate our misguided “improvements” and, hopefully, enjoy our more sensitive renovations and restorations. We realize that our family, the Shreve family, is just one of many who have resided here. Other families will follow us if we are good stewards. We are the successors of those who have gone before us in this old house: the Masons, the Bradfords, the Lattins, the Austins, the Harts, the Becks—and, of course, the girls of Alpha Chi. Your reverence for history is commendable. What a wonderful opportunity to learn about the past life of your house from the people who were there. Thanks for sharing this story.